The festival celebrates the finest in both gardening and food. Visitors can expect stunning show gardens and nursery displays alongside a bounty of food producers, shopping and top tips from garden experts and celebrity chefs. Set against the picturesque Malvern Hills, show gardens are always a number one destination, with five designers being awarded with RHS Gold Medals in 2016. The Floral Marquee is bursting with examples of the finest nurseries in the UK and abroad, with many old favourites and new varieties on sale. The foodie hotspot, Festival Food and Drink Pavilion, is a lively market of food producers offering a variety of artisan produce. At the heart is a Kitchen Theatre where celebrity guests and local producers showcase their skills and produce. Other festival favourites include the School Gardens, Get Going Get Growing pavilion and Family Day (Sunday). RHS Malvern Spring Festival is a joint partnership with the Royal Horticultural Society and Three Counties Agricultural Society. An entirely new vision brings RHS Malvern Spring Festival into full bloom for 2017, taking inspiration from the event’s Spa town heritage. The landmark four-day spectacle, taking place from Thursday 11 – Sunday 14 May at the Three Counties Showground, welcomes all new features and exhibits and a vibrant line up of the finest in gardening, food and lifestyle. BBC Gardeners’ World presenter and acclaimed garden expert, Joe Swift brings to life a new centerpiece of the Floral Marquee – Joe’s Plant Hunter Parlour. This immersive experience like no other features daily talks from award winning nurseries and welcomes budding gardeners big and small to discover, learn and indulge their inner plant hunter. Newly introduced for the very first time, this dedicated zone interprets and explores the theme of health and wellbeing in the 21st century. The centrepiece of the Live Well zone, British Queen of Herbs, Jekka McVicar designs and builds a specially commissioned permanent garden, bringing to life the role gardens continue to play in our health and sense of wellbeing. Jekka’s garden is a living working space for mind, body and senses. The garden is both a tranquil seating space where visitors can spend time amongst the aromatic herb beds, and a place to learn and explore what living well meant in yesteryear and what it means today. Visitors are invited to join daily ‘herbal conversations’ with Jekka herself and explore the awe-inspiring world of alternative therapies. The garden is in support of Pathways, a day service for adults with learning disabilities and difficulties. A horticultural experience by Jon Wheatley, RHS Gold Medal winning gardener and Chairman of RHS South West in Bloom, Grow takes inspiration from interactive Country gardens and wildflower borders, showcasing a variety of edible beds and bountiful Grow To Show competitions. A brand new category introduced for the very first time to RHS Malvern Spring Festival, offering a unique platform for emerging gardening talent. Glorious gardens from up and coming designers bring to life the new vision and reflect the thirst for knowledge, new horizons and innovative technology at the heart of Malvern’s Victorian heritage. Gold Medal winning Chelsea garden designer, Jo Thompson is mentoring the new talent as they embark on this exciting new challenge. The Spa Gardens category also features one garden from an international designer supported by the esteemed Moscow Flower Show. This is part of a newly introduced exchange programme, which in return offers one selected British Spa Garden designer the once in a lifetime chance to showcase at Moscow Flower Show in July. A premium quality shopping experience, it is here that visitors can pick up unique pieces in fashion, furniture, homewares, horticulture, gifts and more from independent designers, craftsmen, artisans and artists. An exciting open-air shopping experience with over 35 nurseries, each showcasing a wonderful array of plants. Plant steals aplenty can be found here, especially during the famous sell-off on Sunday. The heart of RHS Malvern Spring Festival featuring a colourful array of pleasure gardens, a bandstand of live music, an impressive collection of classic cars, an array of global flavours from the International Street Food Market, and plenty of places to picnic. It is here visitors rediscover the Victorian love of amusement, surprise and delight, alongside enjoying unique show gardens unlike any other. A foodie hotspot, the Food & Drink Pavilion is a magnificent celebration of British tastes with bountiful offerings from the country’s best-loved artisan producers. Expect the freshest field produce, big cheeses, bread of heaven, specialty gins, decadent bakes and more. This animated live kitchen, hosted by Mark Diacono, showcases a line up of delicious cookery demonstrations from culinary experts and the country’s top chefs. Mark shares advice from his home farm cookery school, Otter Farm and experience as head gardener at River Cottage. A hive of activity tailored to inspire the next generation of gardeners and horticulturalists with fun hands-on activities to help children learn and explore the wonderful world of plants and gardens. RHS Malvern Spring Festival is one of the only RHS Shows in the UK to have a collection of Show Gardens designed and built entirely by young people. This year sees over 12 schools and educational groups from across the three counties taking part, led by BBC Blue Peter Gardener, Chris Collins. Jekka’s Health & Wellbeing garden, as the focus for the new Live Well Zone, is inspired by the increasing need for reflection and escape from the stresses of modern life. It also seeks to preserve and share the vital knowledge of how horticulture and its associated therapies can help the mind, body and soul. The garden will be a living, working space with a tranquil seating area, where visitors can immerse themselves amongst the aromatic herb beds, and also educate themselves on the place that herbs and horticulture play in today’s society. Throughout the 4-days of RHS Malvern Spring Festival, Jekka will host daily ‘herb conversations’ in the garden, unearthing hidden gems from the world of alternative therapies, food and gardening. Jekka will also provide insights into herbs as the foundation of modern medicine, seeking to preserve the knowledge that over time is danger of being lost. The Health & Wellbeing Garden is in support of Pathways, a work-focused day service for adults with learning disabilities and difficulties. Pathways use gardening and the environment as an educational tool to introduce young adults to the working world. Clients of Pathways benefit from gaining vital skills for entering the working world, these include trust, communication, interaction with peers, taking direction and responsibility for themselves and others. Leaving a legacy, Jekka’s garden will provide Pathways with a nurturing space to continue their works in encouraging clients to grow. Throughout the show times, Pathways will sell plants and refreshments from the garden. Funds raised from these sales go towards covering the costs of the residential trip taken twice each year for clients of Pathways, a vital retreat for clients that contributes to their sense of wellbeing. Outside of show days, Pathways and local schools will host sessions in the garden. The garden aims to inspire visitors of all ages and abilities with engaging elements tailored for all. Jekka’s design will incorporate the unique and flexible WoodBlocX system, specially selected to provide permanent raised bed structures to house the garden’s vast selection of herbs and edibles. The centrepiece of the garden contains four large planted sections featuring smooth curves constructed from the unique WoodBlocX system. WoodBlocX use sustainable, long-lasting, organic and FSC accredited wooden bricks, which can be used to create any shape such as the naturally fluid curves seen in Jekka’s elegant design. Considered an unmatched expert by the UK’s top chefs and horticulturalists, Jekka McVicar is an enterprising British herb grower, organic gardening expert, author and broadcaster. Jekka’s Herb Farm, in nearby South Gloucestershire, boasts the largest collection of culinary herbs in the UK with more than 500 different varieties. Alongside her RHS Ambassadorship for Health through Horticulture, Jekka’s accolades include 62 RHS Gold Medals, Garden Media Guild Lifetime Achievement Award and the RHS Lawrence Medal for the best exhibit shown at any RHS show in 2009. Jekka is also a Vice President of the RHS, Vice President of the Herb Society, is a founder member of the RHS Herb advisory group, and a member of the RHS Three Counties Agricultural Society Joint Committee. 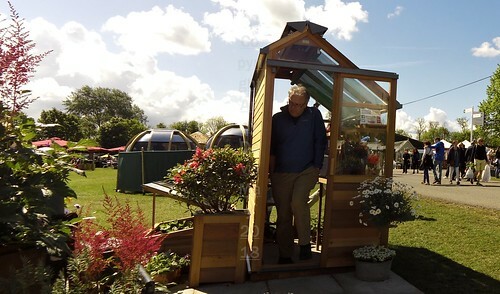 Jekka has herself exhibited at RHS Malvern Spring Festival since 1993 and has been a vital contributor to the team at Three Counties for over a decade.